The Court of Philip the Good, Duke of Burgundy as Philip III. Miniature from the First Page of the Chronicles of Hainaut by Rogier van der Weyden (1400-1464). In the 15th century, two Dukes of Burgundy, Philip the Good and Charles the Bold, accumulated an impressive collection of tapestries of the highest quality. The interest in tapestries spread to Spain and to other European courts. In Aragon, for example, John II and his wife Joanna Enríquez built a collection of several pieces. However, most tapestries were to be found in Castile: John II of Castile and Henry IV, his son and heir, collected a large number of panels, although this was nothing compared to the more than 300 tapestries owned by Isabella I of Castile in 1500, not including those acquired by her husband Ferdinand. 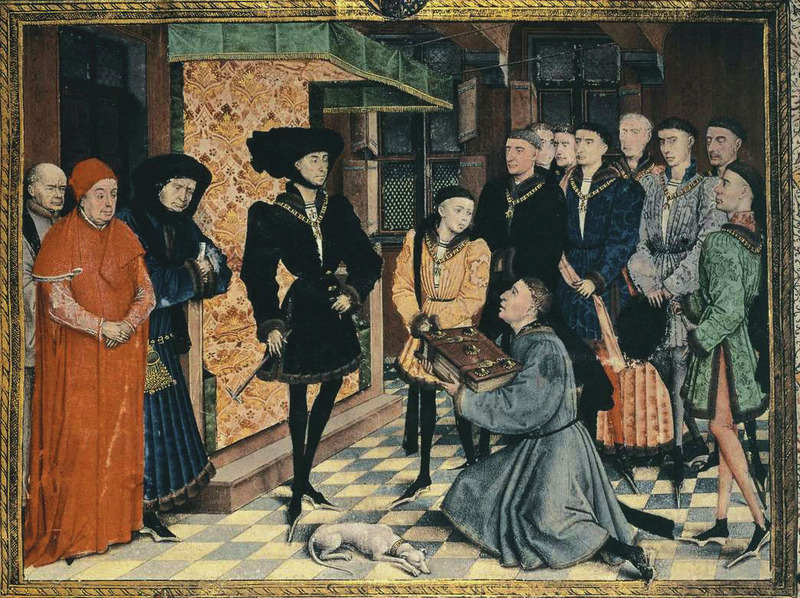 In imitation of their kings, the nobility and leading clergy (such as Bishop Juan Rodríguez de Fonseca and Alonso of Aragon, Archbishop of Zaragoza and son of Ferdinand of Aragon) also took an interest in collecting tapestries, particularly after 1496, when relations between Spain and the Duchy of Burgundy were strengthened thanks to the double wedding between the children of Maximilian I the Holy Roman Emperor – Margaret of Austria and Philip the Handsome – and of the Catholic Monarchs – Prince John and Princess Joanna (who later became Queen Joanna I). Commercial relations intensified and travellers to the Netherlands commissioned tapestries, although these could also be bought from merchants in markets, such as the one in the town of Medina del Campo. By the end of the 15th century there was an enormous number of tapestries in Castile. In fact, when Princess Joanna went to the Netherlands to meet with her husband Philip the Handsome, she brought with her a number of panels of such high quality that the locals were amazed, incapable of recognizing that they had been made in their own country. Isabella I of Castile had also gifted her other daughters with magnificent tapestries and even gave 22 panels to her daughter-in-law, Margaret of Austria. In 1502, when Philip and Joanna returned to Spain to be recognized as heirs to the throne, there were so many tapestry panels in Castile that chronicler Antoine de Lalaing described the places the cortege passed through on the way to Toledo as being lavishly decorated with tapestries hung in the streets and squares. Although the Catholic Monarchs had a large collection, their daughter Joanna I ‘the Mad’ had more than 70 tapestries of her own when she was confined in Tordesillas in 1509. Charles V commissioned several series and enlarged his collection with pieces received from his family. The series of The Honours (National Heritage, Series 8), the Battle of Pavia (Museo Nazionale di Capodimonte, Naples), The Conquest of Tunis (National Heritage, series 13) and the Hunting Trip of Charles V, also called the Maximilian Series (Musée du Louvre, Paris) are only some examples of the spectacular collection which the emperor brought together. Philip II continued with his predecessors’ interest in tapestries. He acquired expensive series such as the Apocalypse, which were added to those which he received through his paternal inheritance, to those he took upon the death of his first wife María Manuela of Portugal and, above all, to those which came into his possession from his aunt, Mary of Austria. Mary had named the king’s older sister, Princess Joanna of Austria, Princess of Portugal,as heiress, but when Joanna died in 1573 her possessions were passed on to Philip. In total, he came to possess over seven hundred tapestries, and he made an exceptionally important decision for their conservation: upon his death, tapestries would remain the property of the crown. The order was endorsed by his successors. Consequently, the Spanish royal collection became the most important collection of tapestries in the world and in a great part has survived to nowadays.